Otago flanker Adam Thomson looks certain to miss New Zealand's Commonwealth Games tilt and could be ruled out of contention for the All Blacks' end of year tour after suffering knee ligament damage. 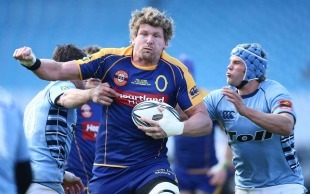 The medial ligament injury came late in Otago's 13-8 ITM Cup loss to Northland in Dunedin on Sunday - Thomson's 50th game for Otago. Thomson has been in fine form during the ITM Cup, putting himself in a position to add to his 17 caps. The 28-year-old speedy forward was to be assessed on Monday once swelling had subsided. Thomson was set to be involved in the sevens team to represent New Zealand in New Delhi in two weeks. Also in doubt for the Games are sevens captain DJ Forbes, who has barely run for the past two months while recovering from a groin injury and playmaker Tomasi Cama, who fractured his cheek last month playing for Manawatu. Forbes returned to the fray off the reserve bench for Counties Manukau in Sunday's loss to Bay of Plenty.